A Cityscape shows a view of a city and is typically characterized by a strong use of GEOMETRIC SHAPE for buildings and windows. Rectangles are most common, since modern buildings are tall. Rectangles also fill these buildings with the RHYTHM and PATTERN of the windows. Windows on a building are an excellent way for kids to see and understand rhythm and pattern (grown-ups too). Windows are spaced in either a REPEATED or ALTERNATING PATTERN, which is often slightly different than a building next door. SIZE, SHAPE, even COLOR can create variety in window patterns. Architects make a conscious effort to design buildings differently, yet create an interesting and artistic geometric silhouette when grouped with already existing buildings. They are paid to design city buildings, which create a nice overall design and “fit” the look of a city skyline. ORGANIC SHAPE is usually included in a cityscape but these shapes are not dominant and often do not even need to be included, since much of a city is concrete, asphalt, brick and steel. Trees, flowers, animals, and people have organic, or natural, SHAPE. Compare the MOODS of these city scenes. How does each picture make the viewer feel? How does the MOOD of any city compare to the MOOD of the countryside? How many ways can a MOOD be described? Compare the various STYLES of each artist. What is the same/different? What do/don’t you like? Discuss LINE. Can kids find examples of each of the 5 different LINE TYPES—horizontal, vertical, diagonal, curved, and zig zag? Which line type is more prominent? Tall city buildings have many vertical lines. Discuss NEGATIVE and POSITIVE SPACE, along with FOREGROUND, MIDDLE GROUND, and BACKGROUND. Which things in a cityscape, seascape, or landscape are positive? Which are negative? Compare HORIZON LINES in the pictures. (Where the sky meets the earth) In a cityscape, the buildings are often taller than trees or mountains, which are usually seen along the horizon line of a Landscape. Some VANTAGEPOINTS make it impossible to see a definite HORIZON LINE (New York with Moon). Make sure ALL 8 pictures are returned to the Packet Carrier after your Presentation is finished. 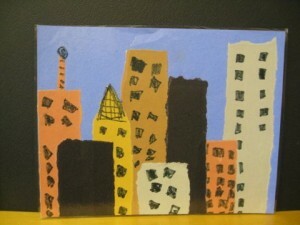 Create a three-dimensional cityscape with a few assorted small boxes. 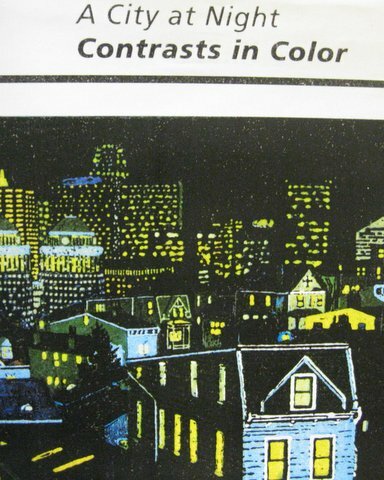 Use tempera in assorted colors to paint each box differently. Create RHYTHM and PATTERN by painting various sized windows on each box, with assorted spacing. You do not want the windows to have exactly the same size, shape, rhythm or pattern on each of your boxes. Each box should be a little different. Attach painted boxes to each other and then to a painted cardboard base. Boxes can be arranged in a cluster or a single line. On the base, paint a sidewalk and a lined street in front of the buildings. Create a three-dimensional cityscape using 3-5 short pieces of scrap lumber 4” x 4”, 2” x 4”, 2” x 2”, 1” x 4” and/or 1” x 2” clustered together and attached to a wooden base. Check lumber stores for damaged pallets that they may be willing to donate. Contractors at a building sight or an amateur carpenter might be happy to donate also. Paint base and each wooden rectangle with a different acrylic color before attaching to base. Acrylic paint will work the best on the wood. Bright colors will also work nicely and a white undercoating will make them even brighter. Windows can be painted with white, blue, gray or yellow, even a few red, depending on the building color. Draw windows on after painting the building so that they will be more uniformly sized and correctly spaced. Remember to make each building’s windows just a little different by changing the color, shape, spacing, pattern or rhythm of the windows. Cut GEOMETRIC SHAPES from colored paper and glue to a black or blue background, depending on the time of day you want for your cityscape. A large yellow circle can represent either the moon or the sun. Use the different PATTERN, RHYTHM, TEXTURES and VALUES found on different pages of a newspaper to cut the GEOMETRIC SHAPES that are needed to create a cityscape. Newspapers have vertical columns, like rectangle buildings. Glue contrasting PATTERNS AND TEXTURES on top of each other for the SHAPES needed. The yellow pages of an old phone book could be used for adding COLOR to window shapes. Some newspapers have colored photographs. Larger, solid areas of color photos could add additional colors for windows, smokestacks, bridges, lights, flowers, or green foliage. Solid, dark areas of black and white photographs could be solid dark windows. The individual pages found in a phone book have even more variations of PATTERN, TEXTURE and RHYTHM than newspaper pages. Glue these buildings to a solid bright blue background for the best contrast. A sky background could also be painted. 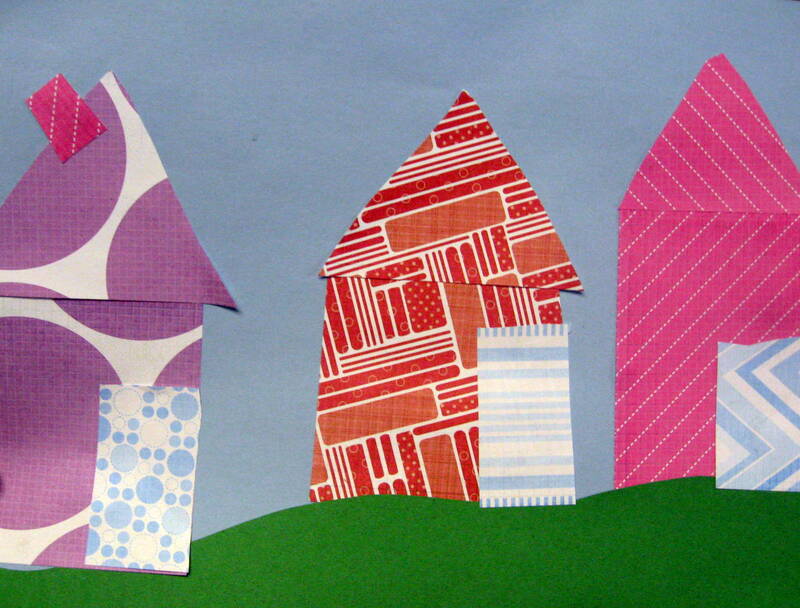 Younger (K-1) kids can each create an individual building from a small milk carton. Cover the carton with construction paper and cut doors and windows from contrasting colors. Glue a folded piece of construction paper to the top and create an overhanging roof. When grouped together for display, the cluster of individual buildings will resemble a cityscape. 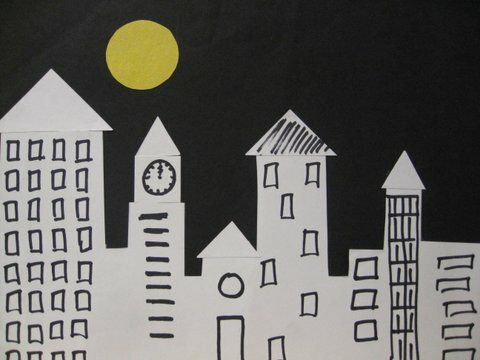 Younger (K-1) kids can exercise gluing and cutting skills, also SHAPE recognition, cutting GEOMETRIC SHAPES for a single city highrise and gluing this to a background. 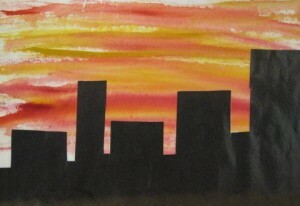 Use only LINE and a single COLOR to create a cityscape with finger paint. This can be an interesting challenge, even for 5th graders, since finger paint isn’t often used after First grade or Kindergarten. 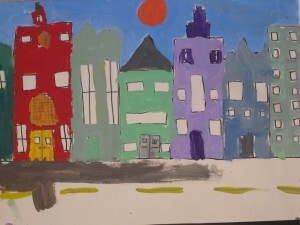 Different analyzing skills will be required and exercised as older kids attempt to create a cityscape they are satisfied with, using a medium that is not usually employed by this age group. It is a much more stimulating and challenging art project for 4th and 5th graders than using a pencil to draw a cityscape with LINE! Younger kids will like it too. Lightly draw a horizon line across a horizontal sheet of watercolor paper or white construction paper. Be sure the line is not in the center of the paper. This line is going to be the HORIZON LINE. The most interesting outdoor pictures painted by artists are the ones with the horizon line slightly higher or lower than the exact center of the picture. Create a bright scene like the famous “painter of light”, Raoul Dufy. Here are a few helpful tips: Use watercolor to fill in the sky and the ground. CLEAN YOUR WATER AND YOUR BRUSH EACH TIME YOU CHANGE COLORS! Begin painting the sky first, from the very top of the paper. The blue of the sky always has a DARKER VALUE at the top of the picture and the LIGHTEST VALUE near the HORIZON LINE. To darken the value of watercolor, use less water, to lighten, use more. Remember to leave a few NEGATIVE SPACES in your sky to create clouds. Lightly paint the lower half of the picture using more water. Use more than one color to cover this area. DO NOT MIX the colors; paint them in separate patches. It is important to keep the colors very clear and clean. CLEAN YOUR WATER each time you change color AND make sure that you rinse out the brush carefully. Let the picture dry (this will not take long). 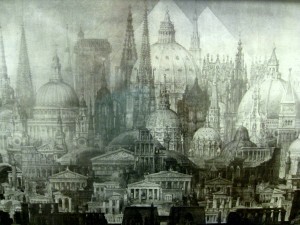 Use pencil LINE to lightly sketch in the shapes of city buildings, trees, and landmarks, above and below the horizon line, similar to Dufy’s style. Now, paint another layer of DARKER VALUE color in the (dry) bottom areas of your scene to brighten each area of color. When this is dry, trace over your pencil lines with colorful felt tip pens. 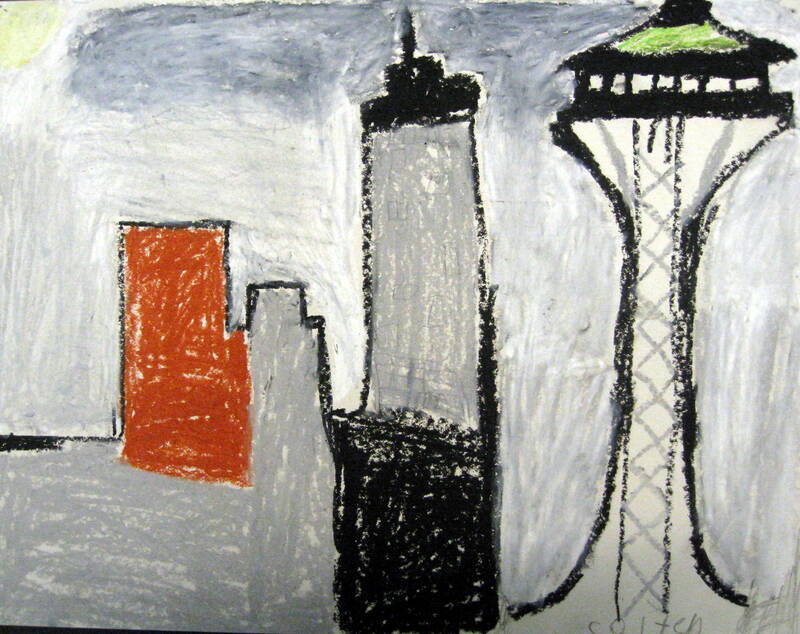 Create a watercolor and colored pencil cityscape of the Vancouver/Portland area. Include either of the two bridges crossing the Columbia River. First, use watercolor to paint background colors for sky, water and land (see above). Create clouds by outlining and leaving empty NEGATIVE SPACE. Vary the colors used for land area patches. Use colored pencils and/or fine tipped marker to create the detail and texture that will finish the scene. It would be helpful to bring in a few photographs or to at least discuss the things that are seen driving across the I-5 or I-205 bridges before kids begin. Bridge styles are also very different. Discussion will help jog memories of the details seen (trees, buildings, Jantzen Shopping Center, Government Island, airport, boats, etc.). Using the window of Nighthawks for an example, draw or paint a view from a city sidewalk, showing a storefront display window. A storefront display is an advertisement. The stores display merchandise in a way that will lure viewers inside. Bright light is important; to bring attention to the things the merchant is advertising. Often a window shows mannequins in fashionable clothing, but the window scene might also tell a story or show action. Mannequins are not always used. Toys and other household necessities (cookware, dinnerware, or appliances) might be displayed in a city street storefront. Fifth Avenue, in New York City, is just one of the famous city streets with interesting and fashionable storefronts. Portland has many decorated storefronts too. Find a photograph of the city of Seattle, showing the space needle surrounded by city buildings. Use the Space Needle drawing page to help draw this Washington city. Edward Hopper painted several scenes from inside a city building, with a window view. Check out such scenes as Chop Suey and Room in Brooklyn, painted by Hopper. Bring in an example of this type of city scene from any artist and have kids draw or paint a city view from the interior, looking out. A different vantagepoint presenting another challenge for 5th graders. The page resembling a brick wall can be used in several ways. The most important one is teaching kids what ALTERNATING PATTERN is. It could be cut out, colored and mounted to a background with a construction paper perspective of a sidewalk glued to the front. It might also be cut into two building rectangles and glued with construction paper rectangles to make a more varied 2-D cityscape; glued to a small box for a 3-D brick effect; painted with watercolor for a painted city building mural. He has been called the most important American realist painter of his time. 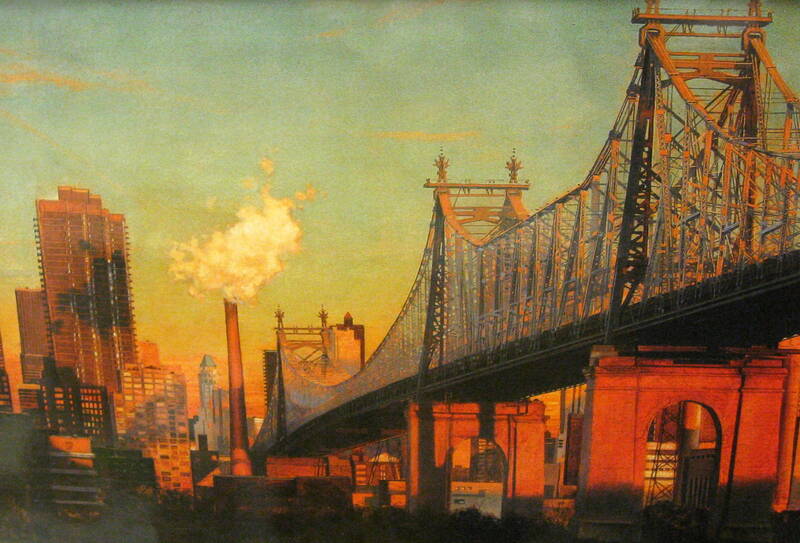 His striking Cityscape, Landscape and Seascape images have captured the essence of 20th century America. Edward Hopper was born the small town of Nyack, New York, on July 22, 1882. His mother encouraged his interest in art from an early age. By the time Edward Hopper graduated from High School, he had decided he was going to become an artist. His parents were worried that he should plan for a secure income so they talked Edward into studying commercial art. In 1899, at the age of 17, Hopper commuted to New York City to study at the Correspondence School of Illustrating. A year later he transferred to the New York School of Art. At the New York school of Art, Hopper’s talent was recognized with prizes and scholarships and later with the opportunity to teach Saturday art classes. In October 1906, with the financial help of his parents, Edward left for Paris, to see the actual works of the great Master Painters. Hopper stayed in Paris for almost eight months. By this time, he was employed by the New York advertising agency C.C. Phillip and Company, where he worked part-time as an illustrator. But Hopper was restless and realized that he would never find total satisfaction doing illustration work, although he worked as a commercial artist and illustrator for many years. At the age of 43, he left commercial work and began painting independently. Hopper spent much of his time traveling around the country, letting impressions collect in his memory. Periodically, he would return to New York City or Cape Cod, where he maintained art studios, to paint what he had seen in his travels. Hopper’s affection for man-made objects led him to paint quiet lighthouses, empty bridges and fragmented city views. This extremely practical American artist had a few unique peculiarities. Hopper was known to wear his clothes until they were threadbare, although he was successful and financially comfortable enough to very easily afford new ones. He loved reading very much. Hopper tended to avoid groups and preferred quiet and solitude. This personal preference is often reflected in many of his works, where the people he paints are often alone and isolated. He achieved this sense of loneliness in his paintings through strong, solid shapes and his use of lighting and shadows. Because he left out much of the detail, Hopper’s paintings have an abstract power, although they are realistic. Hopper was part of a group of artists who were known as painters of the “American Scene”. These artists broke away from the popularity of Abstract art and went back to showing Americans in their familiar setting. 1. 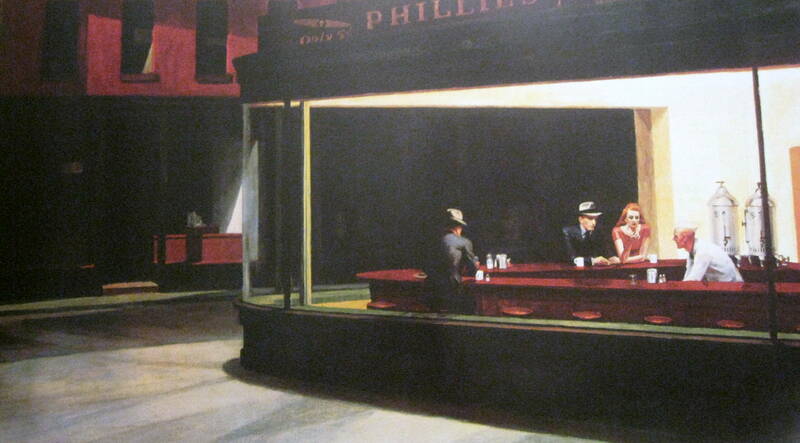 “Nighthawks” by Edward Hopper 33″ x 60” (1942). An actual Diner, on the corner of Greenwich Avenue, in Hopper’s own New York City neighborhood, inspired this fragmented city scene. Through the oversized plate glass window of the Diner, we can observe people from this very large and busy American City. Over the years, advertisements and even television have featured photos, or live action sets copied after this painting, using similarly costumed and placed actors, representing this famous American painting. How would you describe the MOOD created by this painting? Lonely (A Hopper trademark) empty, cold, dark, sad, sleepy, quiet, still? Describe what is happening in the scene. It is a dark and quiet city street—no light in the other building’s windows gives the impression that everyone is gone and the other businesses are closed. We see no cars or people on the sidewalk. A couple sits beside each other, facing us, but they are not talking. One man sits with his back to us. The people are drinking coffee; all customers have a coffee mug on the counter in front of them. This is a city scene but the typical hustle and bustle of fast paced city life is strangely still. The title of the painting, Nighthawks, gives the viewer clues that it is either very late or extremely early, before the sun has risen. What clues did the artist give to let us know the historic period of the painting? The clothing of the people, especially the hats of the men, are from the 1940’s. Above the diner window, we see a cigar advertised for 5 cents. You can not buy much in today’s world for just a nickel! Where is the light coming from? Inside the diner seems to be the only lighting, spilling out on to the sidewalk and street from the large window. Eerie shadows surround the diner. Even the shadows send out a message of loneliness. These sparse objects seem to enforce and echo the people’s individual isolation from one another. Although the man and woman are seated near each other, they seem separate and alone. 2. 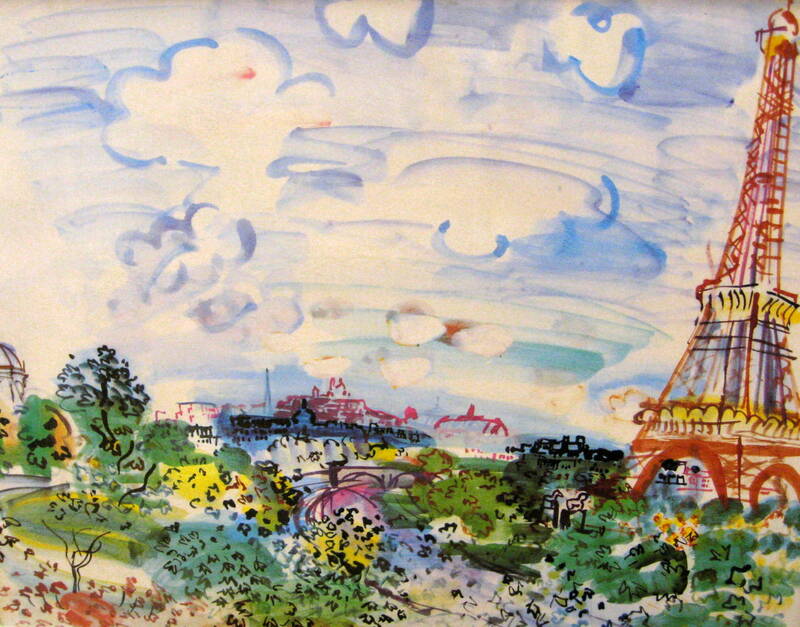 “La Tour Eiffel (The Eiffel Tower)” by Raoul Dufy. Watercolor and Pencil on paper. Circa 1935. Dufy has used pure colors and simple, soft outlines to create this Paris cityscape. The CONTOUR LINES (outlines) of various buildings edge the HORIZON LINE, except for a large tree near the left, and where the Eiffel Tower overlaps the horizon on the right. The artist has also included some important city landmarks. Can you find the Seine River flowing through the city and under the bridge arches? Curved and arched lavender LINES create the bridge arches of Pont Neuf, which crosses over the Seine River, in the center of the picture. The meaning of this French word translates as “new bridge”, which seems funny since it is the oldest bridge in Paris. It was built from stone, by King Henry III, and finished in the early 1600’s, when King Henry IV dedicated it. It is actually located in the very center of Paris, near the famous Notre Dame Cathedral. The painted blue Seine (tinged with lavender) flows away from this bridge, all the way to the FOREGROUND (front) of the picture. Is this cityscape Realistic? No, it is Expressionistic. The artist only outlined major details of the city of Paris, which makes it more easily recognizable to viewers. Dufy was more interested in creating a MOOD to show his feelings for this famous city, than in creating a realistic picture resembling a photograph. This is the Sacré Coeur (sock RAY coor) Basilica, located on top of the highest hill overlooking Paris, in an area known as Montmartre (Moh MAR truh). Montmartre is an area located in the north of Paris, once just outside the city limits. The area developed into a nightclub district and, because rent was cheap here, an area where many struggling young artists of the 19th century could afford housing or art studios. The “Moulin Rouge” cabaret and “Le Chat Noir” are now famous nightclub names associated with artists who frequented and lived in the area. These artists included such famous names as Renoir, Picasso, Edgar Degas, Henri Matisse, Vincent van Gogh, Camille Pissarro, Amedeo Mogdigliani, and Toulouse Lautrec. Famous 19th century nightclub singers and performers in this district included Yvette Guilbert (gee bear) and Jane Avril. What is the FOCAL POINT (center of interest) in the scene? Where do your eyes go first? The Eiffel Tower, on far the right, which is the largest SHAPE. The tower’s red COLOR also helps it stand out and get our attention. Can anyone see MOVEMENT in the cityscape? MOVEMENT is one subtle way an artist gets viewers to see everything in the picture. Point out the way Sacré Coeur (sock RAY coor) Basilica, the domed building, and the large tree (on the far left) create MOVEMENT, causing the viewer’s eye to move away from the Eiffel Tower and across the scene in their direction. On the way, the viewer is led through the other details of the scene, which lay between these three major points along the horizon. Curving LINE or SHAPE is another way an artist creates MOVEMENT. The Seine River is painted with curved line, creating an impression of flowing movement. (3-5) How many LINE TYPES can you see and where do you see them? The tower has vertical, horizontal, diagonal, and curved lines. Curved—bridge arches and the tower base arches; Diagonal—latticed, crisscrossed, or crosshatched lines on top of tower. These are the most obvious. Compare NEGATIVE SPACE and POSITIVE SPACE. Both areas have been loosely painted with watercolor. The sky (negative space) is painted with wide blue lines of color. There is more than one type of blue and there are hints of red here and there. The SHAPES of clouds are outlined in the sky. The ground below (positive space) is covered with more COLOR variety. There are many, many lines overlapping the colors of the cityscape, helping to create the feeling of action and movement in a busy city. Most lines are abstract but some create trees, buildings and maybe even animals (near tower base). African-American artist Charly Palmer was born in 1960, in Fayette, Alabama. He grew up in Alabama and Milwaukee, Wisconsin and dreamed of becoming an artist. He credits his uncle’s doodles and a storybook as two of his earliest influences. Palmer remembers that as a child he was fascinated with a book by Ezra Jack Keats, titled The Snowy Day, which was read to him when he was just 5 years old. This book was printed in the 1960’s and reissued after Charly grew up. After coming across a copy of the reissued book, the artist was surprised to realize the profound effect its collage illustrations had on him. 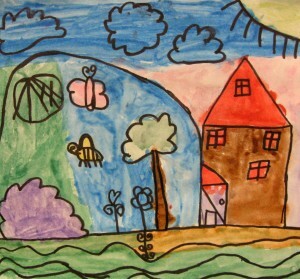 The layered, textured and patterned pictures were created with torn or cut patterned shapes, and paint. Charly discovered that the simple BOLD COLORS and random geometrical SHAPES of the pictures, as opposed to more sharply detailed illustrations of most storybooks, along with the simplicity of the many layered PATTERNS and TEXTURES, were obviously an example which had helped shape his own style. Charly subconsciously had filed Keats’ collage examples away, somewhere in the back of his mind, without ever realizing it! The author and illustrator of The Snowy Day, the late Ezra Jack Keats, had grown up in the city of New York and lived there his entire life. His parents had been Jewish immigrants, who each arrived in America as young adults. The Snowy Day was the very first storybook ever dedicated to the adventures of an African-American boy who lived in a big city. Photographs of a small and real African-American boy, which Keats had found in a magazine advertisement, torn out, and filed in an “idea” folder, inspired this story. Maybe being a small African-American boy himself when the book was first read to him helped Charly’s heart relate to Keats’ unusual art. As a young man, Charly Palmer was also exposed to the work of Viennese painter Gustav Klimt. 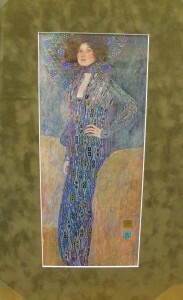 He loved Klimt’s beautifully PATTERNED paintings and, in Charly’s words, they “took my breath away”. 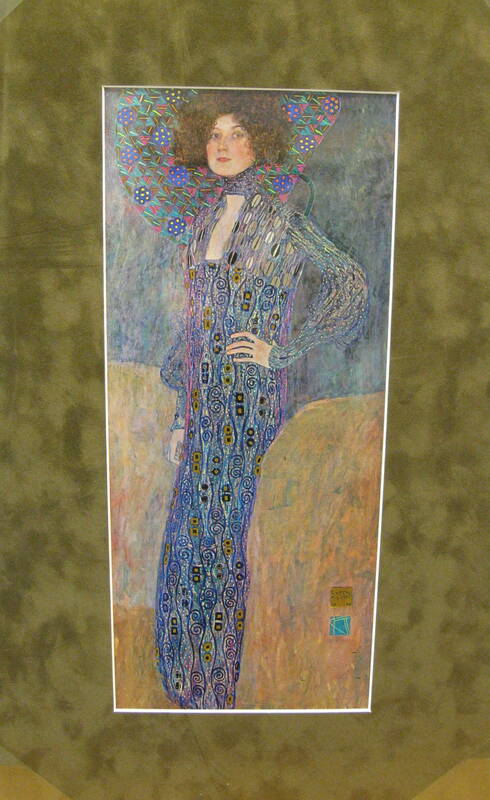 Again, it was Klimt’s flat surfaces (no shade or highlight in the COLOR), metallic LINES, unique mosaic and TEXTURED PATTERNS and SHAPES that most impressed him. Charly wondered how to include his fond awareness for this EXPRESSIONISTIC STYLE— with its bold patterns, textures, shapes, and the quiet NEGATIVE SPACE surrounding them—into his own artwork. All these influences—his uncle’s doodles, the art of Keats and Klimt—along with the artist’s own life experiences, helped Charly Palmer create a unique and dramatic artistic style all his own. All of Palmer’s art connects the artist and the viewer to uplifting themes and messages. His art is purposefully meant to encourage people to listen to their inner voices and feelings. Charly’s art creates a MOOD that makes the viewer think. The positive messages of his art can only be recognized by spending time actually looking at the details of each painting, which are like an unfinished story with an incomplete statement, reflecting a quiet message. Of course, his art also includes Charly’s personal preferences for unique and dramatic TEXTURE, PATTERN, RHYTHM, SHAPE and BOLD COLOR, which has now become his trademark. Now highly acclaimed and honored for his artwork, Charly Palmer’s positive Black images capture a quiet feeling of freedom, dignity and strength. 3. “Leaders” by Charly Palmer (1996). What is happening in this city scene? A young boy walks down a city sidewalk, next to a tall brick building, with a metal fire escape in the upper left corner. The boy has a backpack and carries a book in his right hand. Can you see any PATTERN or RHYTHM in this scene? The rectangle bricks that make up the wall, especially behind the fire hydrant and below the window create a rhythmic ALTERNATING pattern. The spacing of the upper windows and the rungs on the fire escape both create repeated rhythm. What objects can you see in the FOREGROUND of the picture, other than the boy? A red fire hydrant is found in the lower right corner. The boy has just passed a blue mailbox. What clues does the artist give us about this boy? The boy seems to be nicely dressed and on his way to school. The book in his hand and his backpack give us clues. What do you think the boy is thinking? How does the boy feel? Is the boy sad? Point out how the viewer could likely miss what the artist has painted on the wall behind the boy if they look at it too quickly. The random splotches of COLOR on the wall resemble graffiti typically found on buildings in every city. The faces of black leaders painted on the wall sometimes take an extra moment of looking in order to see. Can you recognize anyone on the wall? Who are these people? 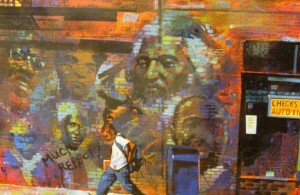 Hold up the picture of Frederick Douglas. Can you find this man painted on the wall? Explain that Douglas taught himself to read. He escaped slavery and became a great speaker against slavery, risking his own freedom, since he was a runaway slave. An Abolitionist, a person who fought to end slavery in America, he was not afraid to speak out and stand up for what was right. He was a leader, an example to black slaves of the power of their potentials. What is your definition of a “Leader”? Some Suggestions: A person who organizes people to do positive things; risks own personal safety and security to stand up for the rights of everyone; encourages others to be their best; thinks ahead about the future and helps build it in a positive way; shoulders responsibility when nobody else will; tries to make the world better for everyone. What positive message(s) is the artist sending? When you first saw this picture, did it seem to be a negative message about this boy’s life in the city, until you looked more closely? At first, the city wall represents a dirty city, full of lawbreakers, which will influence the boy. Then look closer, he is being watched over by past great leaders and preparing for future leadership with his education. The picture has a message of great hope for the boy’s future. The MOOD of the picture is uplifting. The boy represents the positive and good that is found in big, cluttered cities. 4. 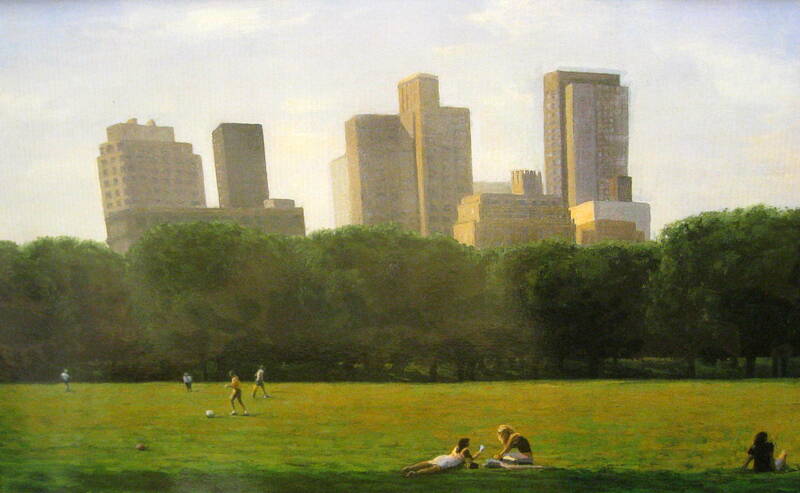 “Afternoon, Central Park, Looking West” by John Beerman. Oil on linen, 16” x 24” (2004). Born and raised in Greensboro, North Carolina, John Beerman earned his Bachelor of Fine Arts at Rhode Island School of Design. Beerman also attended the Skowhegan School of Painting and Sculpture, in Skowhegan, Maine. Beerman’s work is part of many public and private collections, including the Brooklyn Museum, Brooklyn, New York; the Cleveland Museum of Art, Cleveland, Ohio; the Metropolitan Museum of Art, New York; the Museum of Fine Arts, Houston, Texas; and the North Carolina Museum of Art, Raleigh, North Carolina. He has also been the recipient of many awards and commissions. One of John Beerman’s paintings is also among the collection of the North Carolina Governor’s mansion. Beerman says this about his work, “I record and preserve a particular moment in time—a cloud formation, a summer sunset, a winter’s field—a moment when I feel especially connected to the natural world.” He now lives in South Nyack, New York (The same place Nighthawks Artist, Edward Hopper, was born and grew up! This is merely an interesting coincidence.). John Beerman is an artist who still paints today. Central Park is a very large and famous park, located in the heart of New York City. Describe what you see in the FOREGROUND of the scene. The lowest area of green grass is a DARKER VALUE than the strip of grass just above it, indicating it is in shadow; the next horizontal band of grass is yellow-green, a LIGHTER VALUE of green, which makes it appear to move away until it meets the band of green trees; three girls are sitting in the grass between the edges of the shaded grass and the sunny grass; one girl has her back turned away from us. The other two girls face each other, one lying in the grass on her stomach, the other sitting. These girls look as if they have books and are studying. A stray ball lays in the grass to the left, just above the lower shade. We can see another ball, being kicked by someone, a little higher in the picture. Three other people can be seen behind this person, near the top of the band of yellow-green grass. The one on the farthest left is posed as if they have kicked the stray ball; the other two appear to be walking towards the trees. Describe what you see in the MIDDLE GROUND? A horizontal line of trees moves completely across the picture, from left to right. The trees add a third VALUE of green to this scene and OVERLAP the bottom of the buildings, creating an illusion that the buildings are farther away from us than the trees. The trunks of these trees create vertical LINES. What types of LINE do you see? Can you find an “implied” DIAGONAL LINE? An implied Line is not as obvious. Look at the arrangement of the people across the foreground of the picture. Do you notice how the people have been placed in a DIAGONAL arrangement? This implied line (placement of people) creates MOVEMENT into and across the scene, in a diagonal direction. Diagonal lines create a feeling of ACTION and MOVEMENT taking place in the FOREGROUND. Besides the green colors, do you see any other varied COLOR VALUES? The buildings appear to be different VALUES (lighter and darker) of NEUTRAL COLOR. 5. 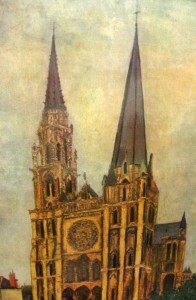 “Chartres Cathedral” by Maurice Utrillo. 35 ¾” x 19 ½” (c. 1913). Maurice Utrillo was born on Christmas day, in 1883. He was the son of the artist Suzanne Valadon (who was born Marie-Clémentine Valadon). Maurice’s single mother became an artist’s model after a fall from a trapeze ended her chosen career as a circus acrobat. 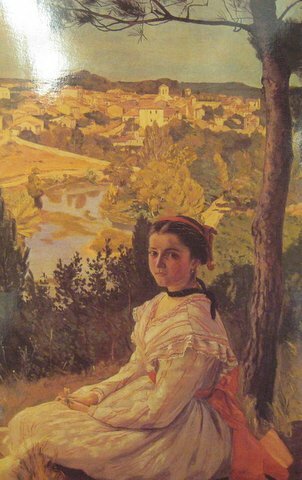 Suzanne posed for such famous French artist’s as Pierre Renoir and Toulouse Lautrec and was encouraged, as she became an artist herself, by another famous French artist, Edgar Degas. Utrillo’s mother is the woman seen in Dance at Bougival, painted by Renoir. She taught herself to paint and became an equal all of the artists that she had posed for. Unfortunately, Utrillo’s mother was so busy earning money to support them that his grandmother was left in charge of raising young Maurice—not easy with his very moody and wild spirit. He was an extremely anxious youngster and a poor student in high school. Maurice often skipped school and got into trouble in other ways too. As a young man he became a bank clerk and failed in this profession. His young life had a lot of sadness and loneliness and so was his later life. Mental illness entered Utrillo’s adult life, at the age of only 20, when he was forced to spend time in a mental hospital. Unfortunately, throughout his life, Utrillo’s mental disorder resulted in repeated hospital stays, in many attempts to get better. Many artists have been to the city of Chartres, in northern France, to paint its beautiful Cathedral. This 13th century church, built on a hill in Chartres, is famous for its stained glass windows. The Cathedral was built from AD 1194 – 1260, making it the quickest construction ever for one of the finest examples of Gothic Architecture in Europe. It is the sixth church built on the site. Four earlier churches were destroyed and the 5th church burned, with only one of its spires remaining. The church was built quickly—considering Cathedrals generally took 200 years or more to build—because citizens of every social rank assisted in its construction, around the one remaining spire. Usually, rich people let poorer citizens do all the work, but the city was probably tired of losing 5 costly churches at this location, and tried to cut costs, as well as time. The spires are unequal. The oldest spire was built in the much plainer, earlier Romanesque Style. The newer spire is more richly adorned with extra detail, in the later Gothic Style of decoration. Utrillo was 30 when he painted this view of Chartres Cathedral. He was a religious man in his adult years and viewed this lovely Cathedral with respect and humility. He worked with patience as he painted the many details of the church. Maurice Utrillo did not paint his own signature in the lower left corner of this scene. His art dealer did not like the look of the artist’s handwriting, which the art dealer felt was too “huge and ugly” to fit with the pictures. The art dealer asked the artist’s mother to sign Utrillo’s name on paintings for him. Do you remember that Maurice’s mother was also an artist? Why might an art dealer make a big deal about an artist’s signature? Maybe the artist’s signature detracted the viewer’s eyes away from the scene of the pictures. Maybe he liked to be bossy. Do you think talented artists usually have artistic handwriting? Not necessarily or even usually, this is sometimes surprising. 6. 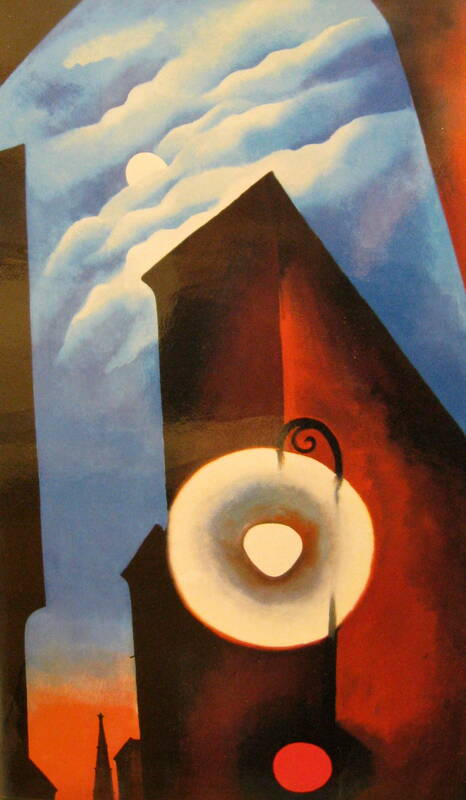 “New York with Moon” by Georgia O’Keeffe. Oil on Canvas, 48” x 30” (1925). Georgia went to art school, in 1905, at the Art Institute of Chicago. At the turn of the century, female students had finally been admitted to most American Art schools. Even so, in 1905, Ida O’Keeffe (Georgia’s mother) was considered ahead of her time for sending her daughter to Art school. 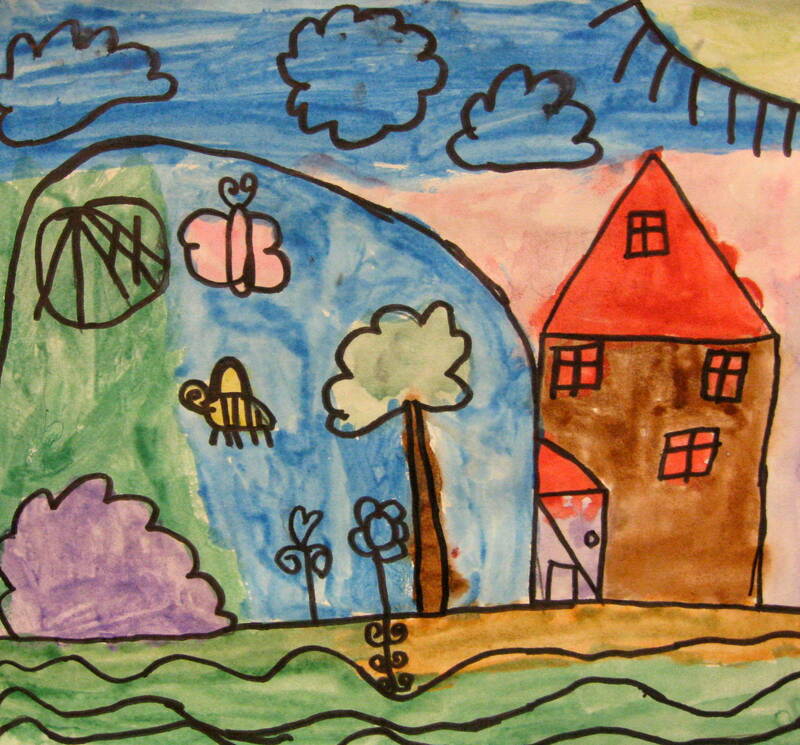 Georgia wanted to paint what was important to her but her teachers felt she should study painting by imitating the works of other artists. Georgia’s teachers wanted her to paint what they saw, instead of what she saw. Her vision of art was original and imaginative. She did not want to draw or paint what others had created. When Georgia discovered that some of her art resembled that of other artists, she destroyed it! In 1915, Georgia moved to South Carolina to teach Art in a school and a little later to Texas. While she was there, Georgia sent several of her drawings and watercolors to an old school friend for comments. 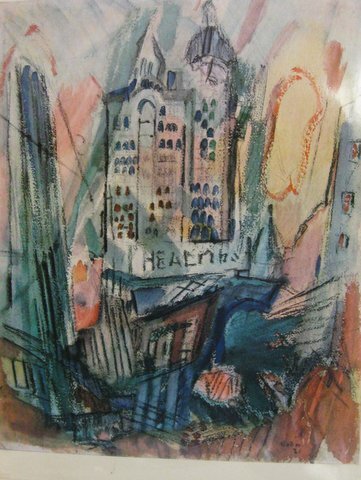 Her friend, who lived in New York, showed O’Keefe’s unusual watercolors to Alfred Steiglitz, a New York Art Gallery owner. He was a powerful and well-known figure in the New York City art world and his Art Gallery was called “291”. Steiglitz, who was also a photographer, immediately recognized Georgia’s rare abilities. Soon Georgia was living and painting in New York City. A very close relationship between Steiglitz and O’Keeffe began. As artists, they supported each other’s work and drew inspiration from each other. In 1924, Steiglitz and O’Keeffe were married. “I lived for a while in the New York studio of Stieglitz’s niece, Elizabeth. It was on the top floor of a brownstone house next to the back of the Anderson Galleries on 59th Street. The studio was bright with a north skylight and two south windows…When I knew I was going to stay in New York, I sent for things I had left in Texas…At that time Park Avenue, lined with brownstone houses, seemed to stretch way beyond 59th Street and on to infinity. It was a quiet sunny street—a pleasant place to walk although the underground trains [subway] were visible in some places…as I walked down Park Avenue, I saw the Shelton (name of the building) being built on Lexington Avenue. “Later, when I was looking for a place to live, I decided to try the Shelton. I was shown two rooms on the 30th floor. I had never lived up so high before and was so excited that I began talking about trying to paint New York. Of course, I was told that it was an impossible idea—even the men hadn’t done too well with it. From my teens on I had been told that I had crazy notions so I was accustomed to disagreement and went on with my idea of painting New York. “My first painting was a night scene of 47th Street, New York with Moon. There was a street light in the upper foreground at about the Chatham Hotel. The next fall five of us had a group show on the top floor of the Anderson Galleries…At the end of the hall just outside the door of the show was a perfect place for my first “New York” [referring to this cityscape]…it would have been seen when you stepped out of the elevator to go toward the show. But the “New York” wasn’t hung [shown]—much to my disappointment. “The next year Stieglitz had a small corner room at the Anderson Galleries. As you entered, you saw my first “New York” between two windows…My large “New York” was sold the first afternoon. No one ever objected to my painting New York after that”. Georgia has painted some tall buildings in New York City, from an unusual VANTAGEPOINT, which creates a very unusual perspective. The painting begins at a level that is higher than the street, because we can not see the sidewalk or street. Where do you think Georgia O’Keeffe was standing? There are many GEOMETRIC SHAPES in this picture. How many circles can you find? Can you find any rectangles or squares? Are there any ORGANIC SHAPES? The moon and clouds are organic, or natural, shapes. What is the first thing your eyes see when you look at the picture? How did the artist create MOVEMENT through the picture? The center of interest (FOCAL POINT) is the street light with its circling glow of light. This is the DOMINANT and lightest area of the picture. Then our eyes travel up the building to the next area of white light, the moon and clouds in the sky. The rough triangles in the upper corners of the picture cause our eyes to stop and move back down to the church steeple and red dot at the bottom of the scene. What type of LINE do you see? Mostly vertical but also diagonal and curved (on lamppost) Most of the lines in a scene are implied line, which are created where straight edges of colors meet, instead of painting actual lines. Vertical lines move our eyes up and down the picture. They make us think of buildings and trees. Diagonal lines move our eyes from one corner of a picture to the opposite corner. Diagonal lines create a feeling, or MOOD, of excitement. Horizontal lines guide our eyes across a picture and create a calm and restful MOOD. What type of MOOD does this painting create? 7. “Winter Light, East River” by Simeon Lagodich. Oil on panel 14” x 18” (1990). Simeon Lagodich is an American realist painter. His work can be found in many major American corporate and private art collections. His art has also been reproduced in a number of books on American realist painters. A native of Kenosha, Wisconsin, Lagodich completed post-graduate studies at the Brooklyn Museum School of Art, in New York City. He also works as an expert in period frame gilding and restoration techniques and is co-owner of Gill & Logodich Fine Period Frames & Restoration, in New York City. The view depicted here is not a glamorous part of New York City, but the industrial section. Industrial areas of a city are filled with factories and business offices. Smokestacks are often seen on buildings that manufacture items and are a way to identify the industrial areas of cities. Can you see any LINES that create MOVEMENT? The bridge is the most DOMINANT object in the picture. Diagonal lines move our eyes. The wide, diagonal line of the bottom of the bridge causes our eyes to move toward the smokestack, with the white smoke floating out of the top, which is the lightest area of the picture and where our eyes stop for a moment, then move down the smokestack. After these first two things, our eyes begin to examine the rest of the scene. The artist has led us into the city he painted. Bridges are a common detail often found in cityscapes. What type of LINE do you see on the bridge? Where do you see vertical LINE? (Don’t forget the smokestack.) Horizontal LINE? Curved LINE? Besides the PATTERNS found in the building windows, what type of PATTERN in this scene is different from the other pictures? The repeated LINE PATTERN of the bridge structure. These LINES create RHYTHM, because they are spaced the same distance apart across the bridge, similar to the regular rhythmic beat of a drum in music. Look at the COLOR the artist used in this scene. Do you see more WARM COLORS or COOL COLORS? Although the sky fills a large part of the picture and is a COOL blue, the predominate colors, reflected on the structures and in the water, are WARM. Point out the way the artist has even used a warm orange, to reflect light on the frame of the bridge, which is gray concrete. Create a REFLECTED industrial area cityscape. Draw a horizontal line about 3-5 inches above the bottom of your paper. This will be the edge of a shoreline. Draw your buildings, and smokestack(s), above this line. When you finish your drawing, turn your paper over and draw the same scene reflected upside down in the water. paint or color your scene. 8. 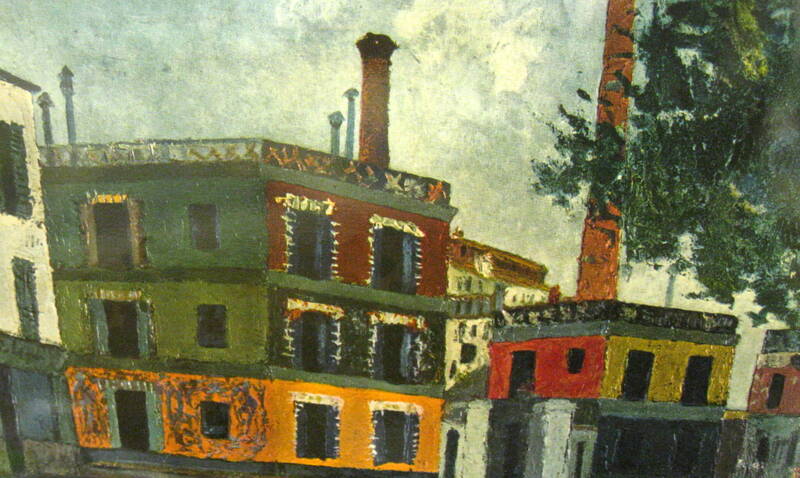 “Les Fabriques (Factories)” by Maurice Utrillo. 19 ½” x 28 ¾” (1911). On the advice of a doctor, Maurice’s artist mother urged her son to take up painting as an emotional outlet to regain his stability after he left the hospital. This therapy worked so well for talented young Maurice that he went on to produce thousands of paintings and pencil sketches that made him famous. By 1920, Utrillo was such a successful artist that his paintings were known internationally. He painted some of the great and beautiful Cathedrals of France but it is as the painter of the poor and much less important streets of Paris, cityscapes of the Montmartre (Moh MAR truh) area, that Maurice Utrillo will be forever known. Montmartre was where Utrillo was born and where he lived his entire life. Ironically, it was a deeply unhappy person who avoided the beautiful corners of Paris and sought out this combination of bare, dirty walls to establish his fame as an artist. The sad streets he painted represented Utrillo’s constant struggle against the invisible forces of depression and mental illness. This is a dreary factory neighborhood, an industrial area, found in the Montmartre section of Paris. The buildings were not painted these bright colors in real life. The normally dismal, dirty, neutral gray factory walls have been given a much more uplifting MOOD with the colors the artist has chosen. 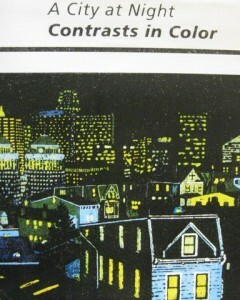 The COLOR of the buildings and the black of the windows and doors create conflicted, or opposite, feelings. There is an uneasy and eerie feeling, or MOOD, of deserted emptiness. Under the pleasant afternoon sky, the absence of human beings is haunting. In 1911, trucks, or wagons with horses would have been seen traveling the streets, even in an industrial area, where they would have been loading or unloading for deliveries. Can anyone remember another cityscape showing Montmartre (Moh MAR truh)? The Raoul Dufy cityscape La Tour Eiffel shows Sacré Coeur (sock RAY coor) Basilica, which was located in the area of Montmartre. What SHAPES do you see? GEOMETRIC rectangles fill the scene along with the unexpected ORGANIC shape of a treetop, off the edge of the picture. The troubled artist finally fell in love and married sometime in his 50’s. Although his life was filled with many periods of unhappiness, Maurice lived to be almost 70, dying in March of 1953. Charles Robert Cockerell was an English architect, archaeologist and writer. Cockerell was born in 1788 in London, and was educated at Westminster School in Latin and the Classics (Greek and ancient literature). He became an apprentice in his father’s architectural practice at the age of 16 and later had his own architectural firm. From 1810 to 1817 Cockerell traveled through Europe and Greece traveling and sketching and excavating ruins in Greece. Cockerell’s seven years of travel and the study of ancient architecture in Sicily, Greece and Turkey produced many drawings of architecture and architectural elements. This creative and astonishing drawing was described as ‘A synopsis of the principal architectural monuments of ancient and modern times’ when first displayed at the Royal Academy in London. The design draws the viewer in and invites the imagination: what if all the most amazing buildings of the world were in the same city? 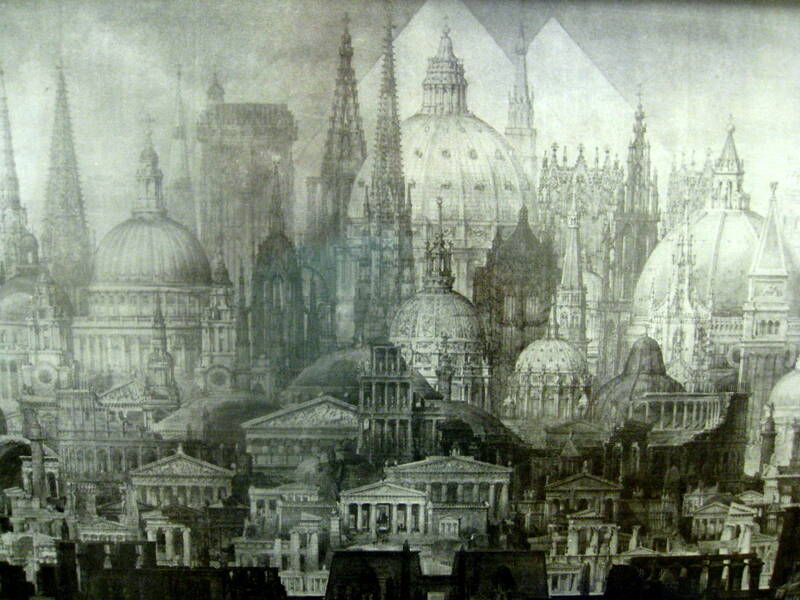 This drawing is a vision of great buildings through the ages. The ‘Professor’ of the title was a description of Cockerell himself, as he was a professor of architecture in the Academy for 20 year (1839-59). 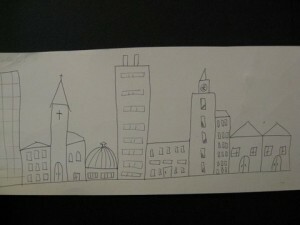 If this drawing is a bunch of really great buildings and monuments…where is the Eiffel Tower? Why didn’t Cockerell also draw in the Empire State Building and the Space Needle or Taipei 101? Cockerell died in 1863 – so the drawing was done before the Eiffel Tower was built! The Eiffel Tower was built in 1889, the Space Needle in 1962 and Taipei 101 (101 story tower which is a landmark in Taipei, Taiwan) was built 1999-2004. 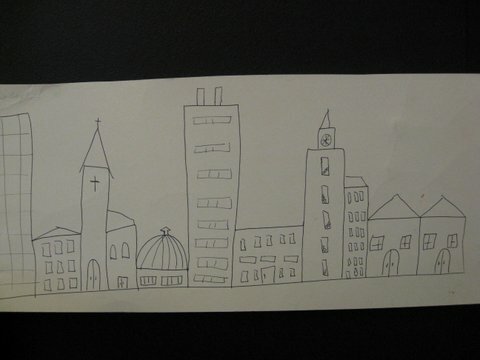 What famous buildings would you draw if you could design a city? Any famous landmarks are good – or they might say they would design all their own and that is fine, too, of course. 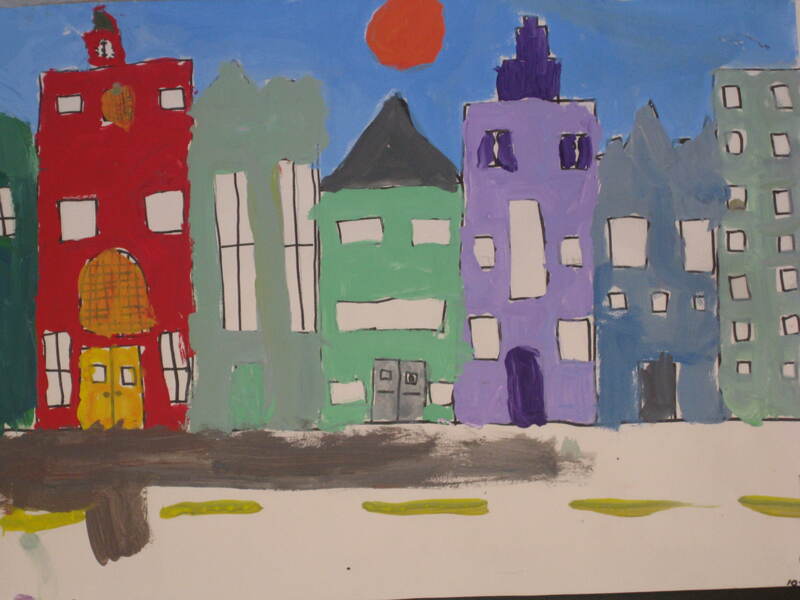 Have the students design their own city, and hopefully draw in maybe 2 different buildings, elements or architecture from 2 different countries. René Magritte was a Belgian surrealist painter. Magritte painted witty (funny and clever) art works that make you think about how you look at things and maybe even how you think about what you see. Magritte began drawing lessons at age 10 at the Royal Academy of Fine Arts in Brussels…but he did not find the teaching exciting or challenging and he went into the military and then worked at a wallpaper company for a while. Though he had been painting for many years, Magritte was able to paint full time in 1926 thanks to a contract with a gallery in Brussels, Belgium. He had his first exhibition in Belgium in 1927 which was not a success. So Magritte then moved to Paris and became involved in the Surrealist movement. He then had a long and interesting career that included running an advertising agency with his brother and later, producing art forgeries of the works of famous artists! Magritte’s art works have influenced many types of art, including the Pop Art movement. 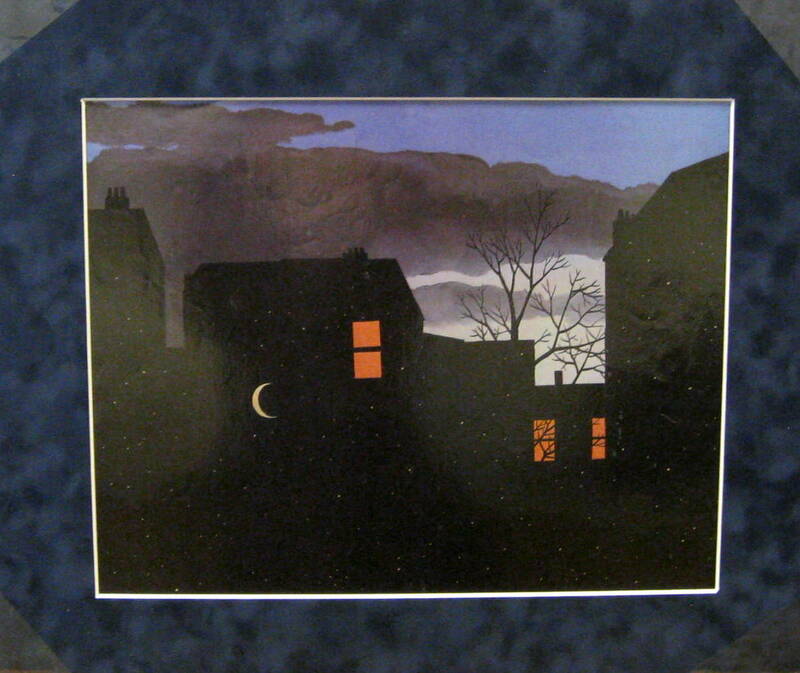 Magritte painted a scene with a house and the moon and stars. But he did not paint the moon and stars in the sky…the moon and stars are the house…or the shape of the house is actually the sky?? It looks like winter, since the sky and clouds look grey and windy and the tree is bare of leaves. The shape of the house is lit from within – the three windows are orange with light but we can see no furniture or people within the house…just some branches of the tree through the two lower windows. What is going on in this picture? The Universe is my home (? )…who knows what the students will respond to this but you may want to write down some of the answers! What was the artist trying to say? 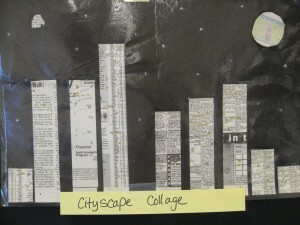 This is a thought-provoking art work – it is OK if the students just want to look at it and think about it. Invite the students to create a drawing of something that may seem impossible – imagination necessary here! This may be tough for some students but encourage them to have fun with it or have a few suggestions ready.